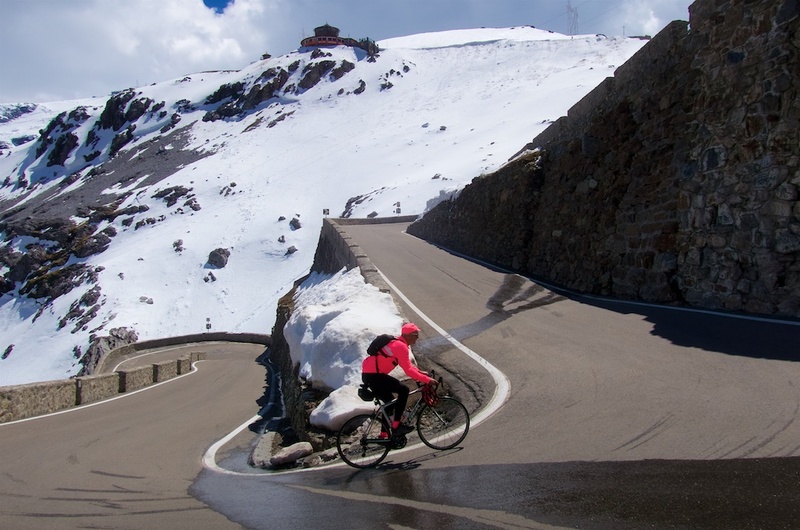 I had the good fortune to cycle Passo dello Stelvio the day before the Giro d’Italia. 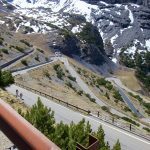 I would cycle the south-western Bormio side, then descend much of the famous east side, allowing me to turn-around and climb the best stretch of hairpins anywhere. 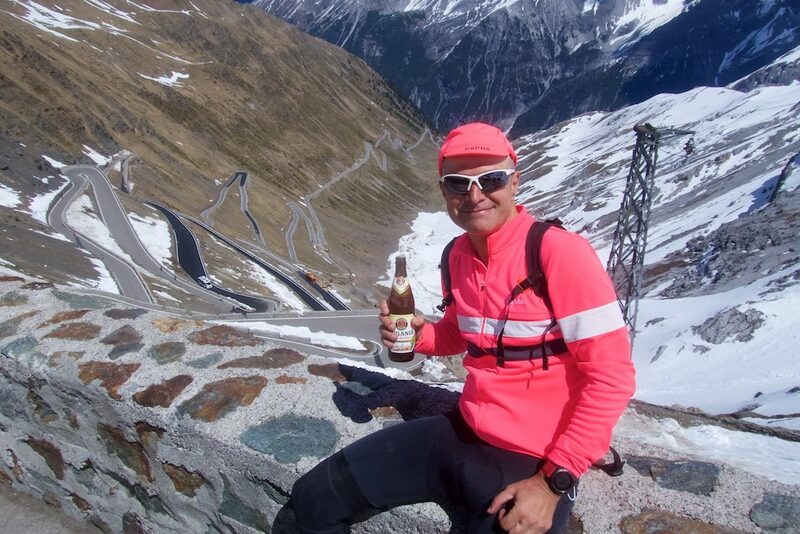 Long story short: I cycled 2 sides of Stelvio, while wearing pink, then drank beers. The weather was great. While relatively busy, there was a festive atmosphere, so I took my time chatting with all sorts of people and of course, I took lots of photos. 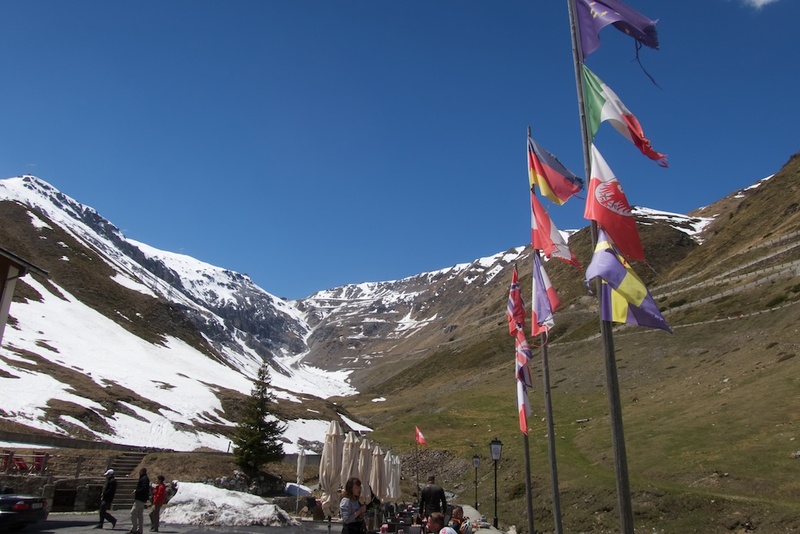 The Bormio side, has 40 signed hairpins. Should hairpin sign #1 be at the bottom or the top? 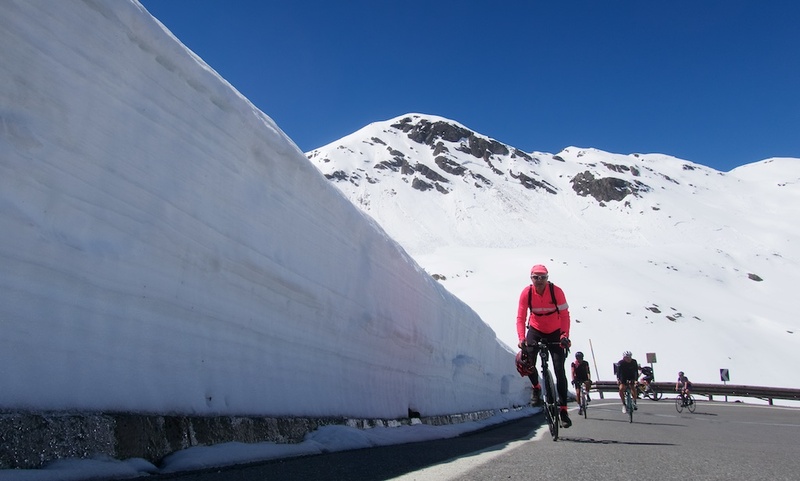 If you’ve slowly cycled a monster like this the answer is easy. #1 is near the top so you can slowly count down your progress while suffering like a pig. 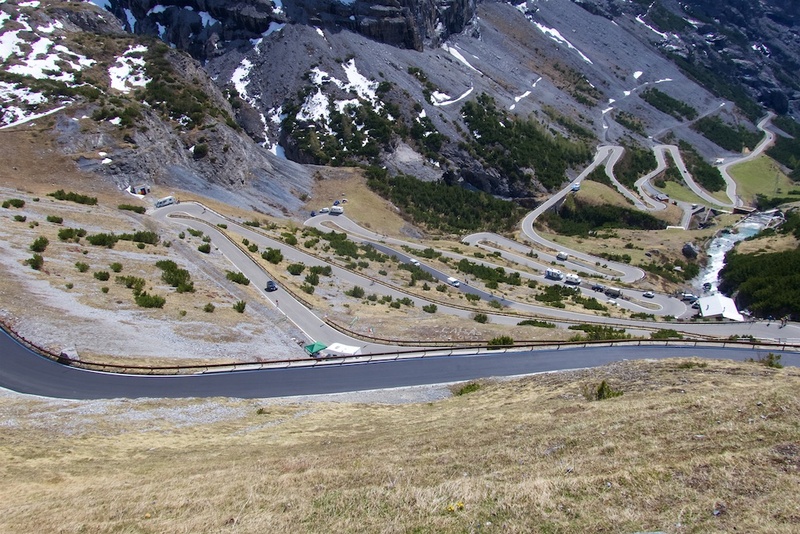 Hairpin #40, at the bottom. 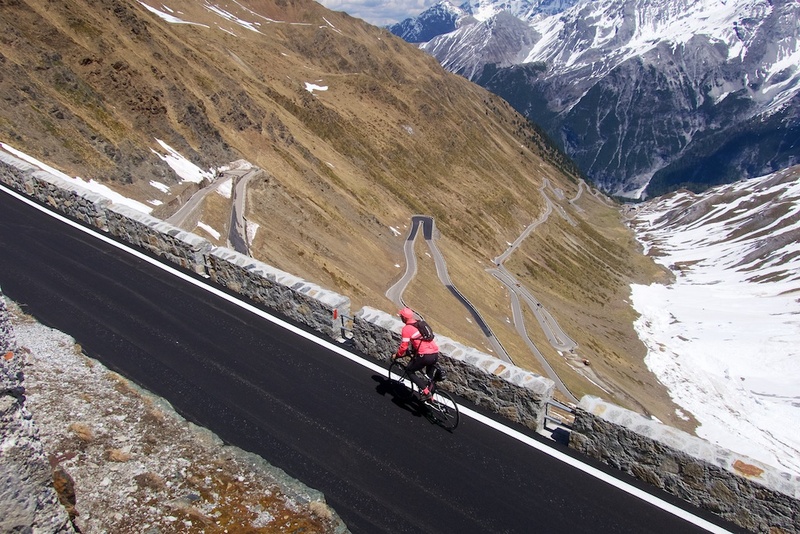 After a kilometre or two, it becomes beautiful until the summit. 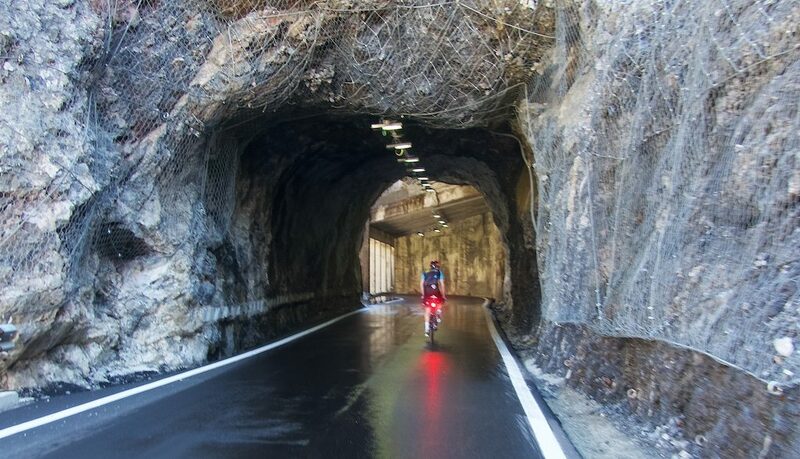 Soon there is a series of short tunnels (avalanche protection), perhaps 6. They are not too long but note, many are very wet inside, with turns. Bring a backlight for the ascent, and be careful descending. 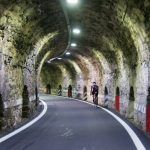 Just after the tunnels and before the best part of this side the road gets steep, the steepest stretch on the climb. 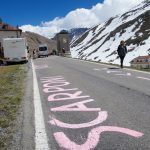 Luckily someone kindly painted the details on the road. Next, is an absolutely fabulous series of hairpins. Not quite as good as the famous side. But still quite awesome. 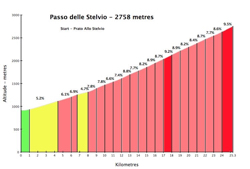 Stelvio was built in the mid 1800’s. 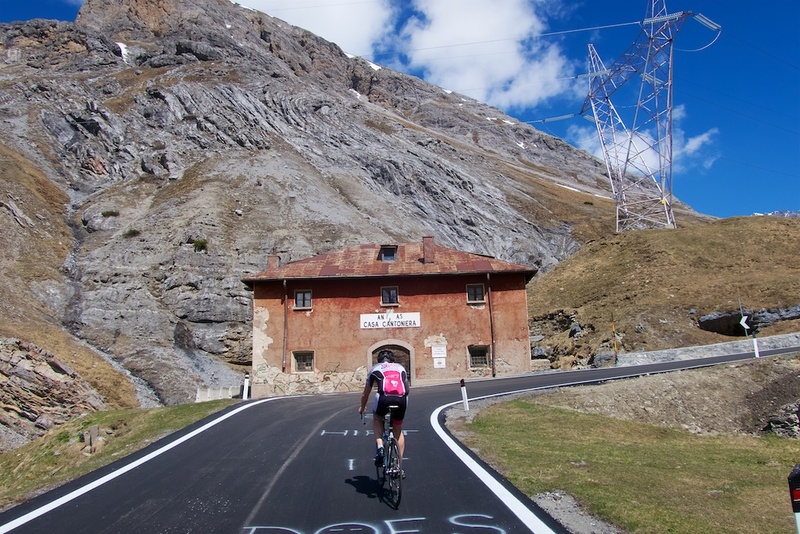 The photo below is one of four Cantoniera building built in the 19th century as rest stops for travellers and (I think) to lodge people responsible for maintaining the road. 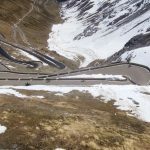 See this old post on a brief history of Passo dello Stelvio – included details on the 3rd was up via Umbrailpass. 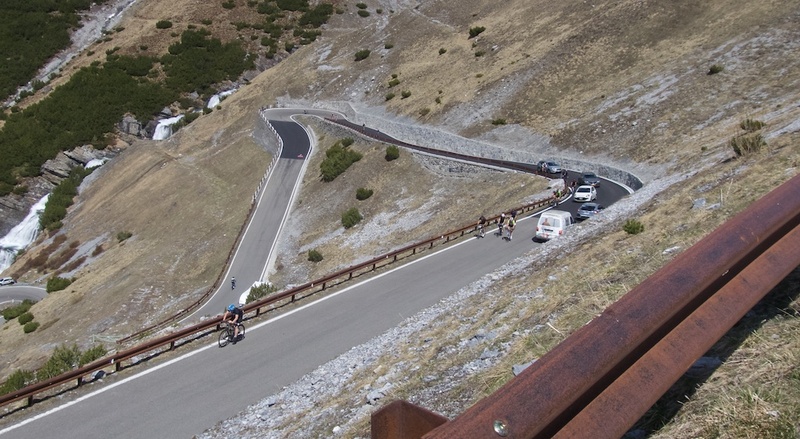 Above these hairpins, things get a touch easier. 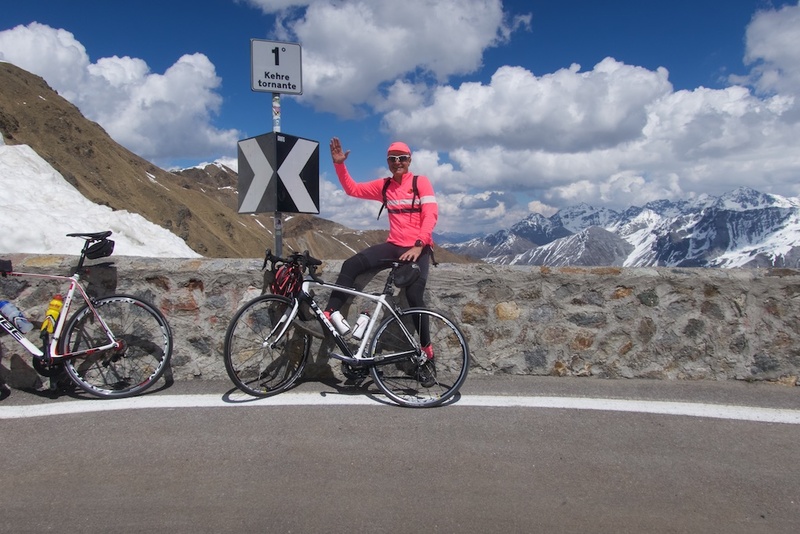 Perhaps 3 kms from the summit is the intersection with Umbrailpass. 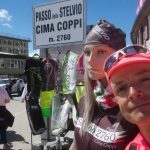 There were – surprisingly – Italian customs officers there, but they waved innocent old me through. The pass is only a couple of hundred metres away. There is a relatively new exhibition remembering the White War (WW1) fought here between the Austrians and Italians … the highest fighting in Europe? 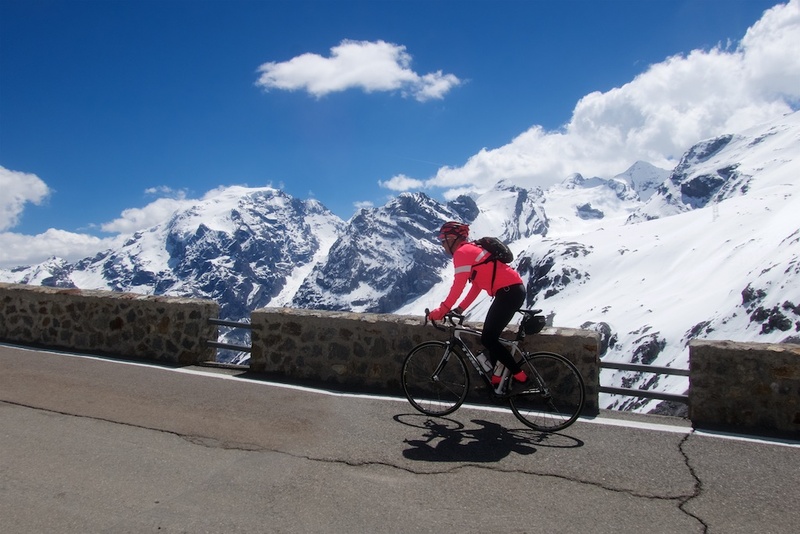 Just above my head is Passo dello Stelvio summit. 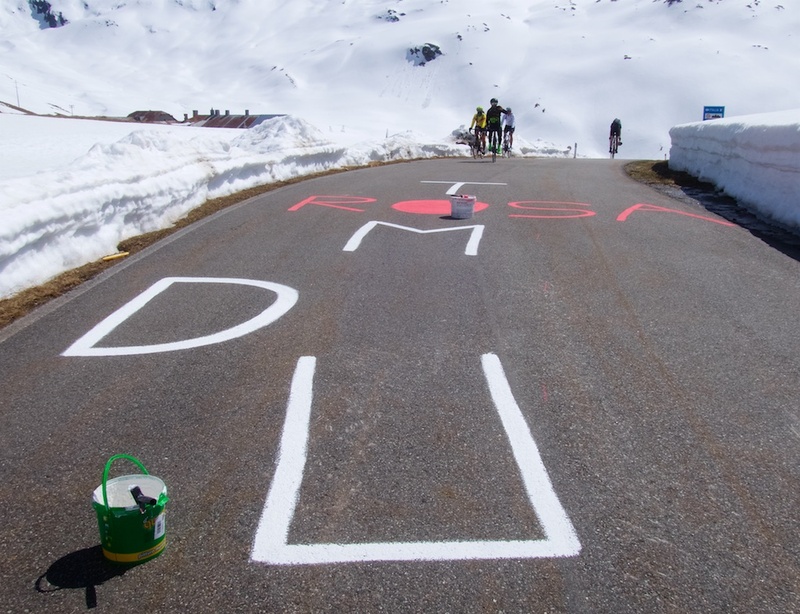 Exactly at the highest paved point in Switzerland, an enthusiastic Dutch man was painting the road. I congratulated him. He said it wasn’t finished. I said: “you need moulin.” He smiled and said “no, I am going to write Milan.” and looked at me proudly. We then debated who would win tomorrow’s stage. He lost interest when I told him Pinot would win easily. 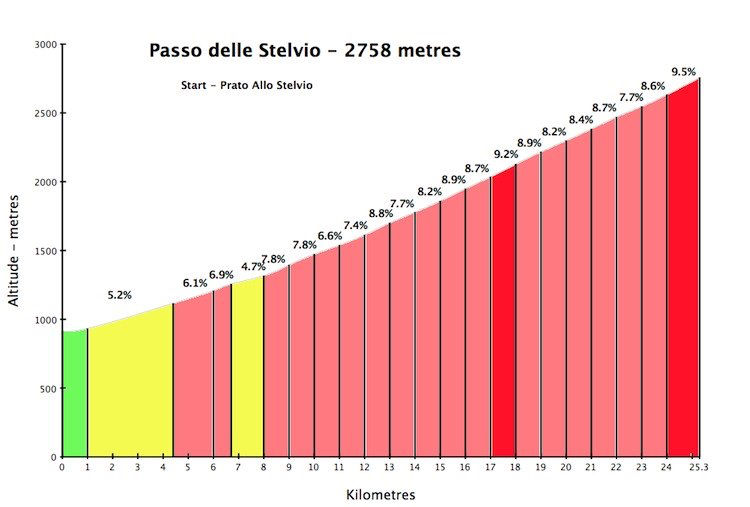 I doubled back and continued up towards Stelvio. Now there was more snow. Although far less than one would usually expect at this time of year. Soon, I was at the summit. 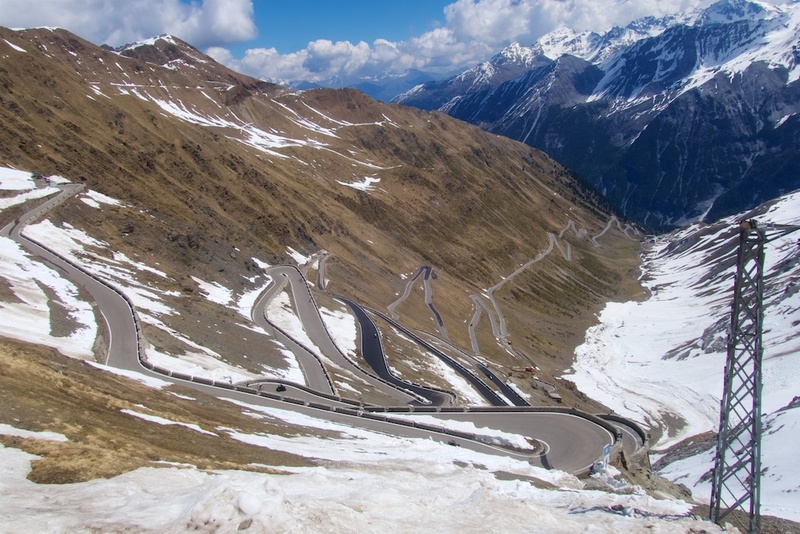 When I think of the highest mountain passes in Europe, they are usually deserted or very quiet. 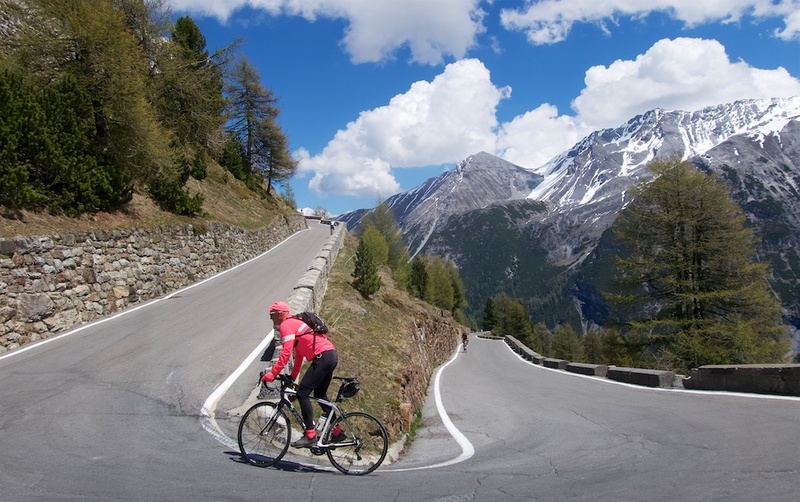 Higher than Stelvio, Iseran has a chapel and a small, often-closed, restaurant. Colle dell’Agnello has nothing. 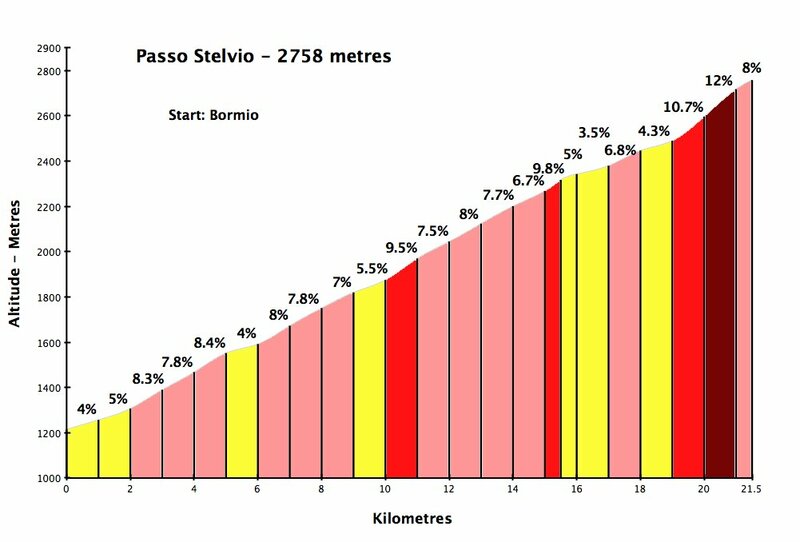 Nearly as high as Stelvio, Passo di Gavia has one restaurant, Col de la Bonette nothing, Fauniera nothing, Nivolet a restaurant or two, etc. 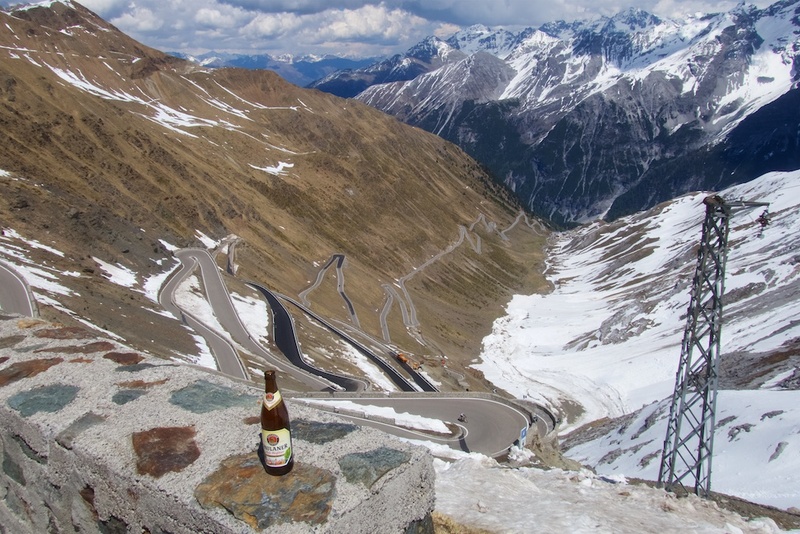 But Stelvio is a party. This photo misses the majority of stuff. Hugely developed. After some calories, I descended the famous eastern side. 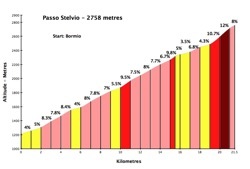 Look, when asked my favourite Alpine climb I am guilty of naming slightly obscure stuff (to seem cool?). 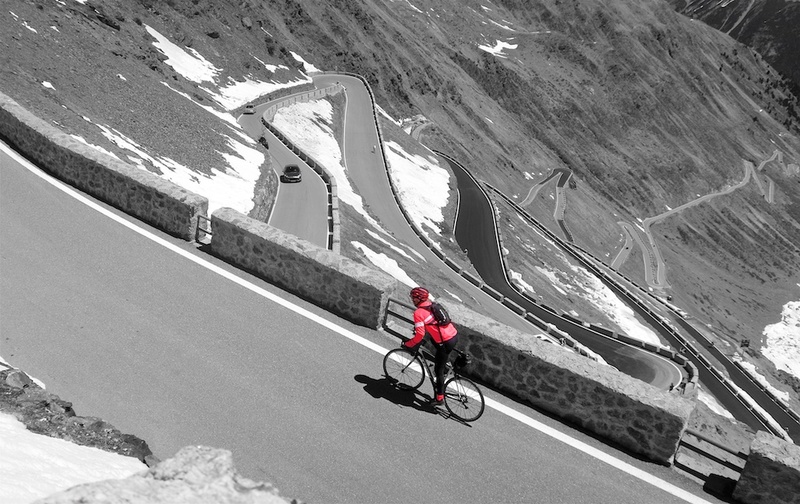 But wow, there is absolutely nothing like the famous side of Stelvio. 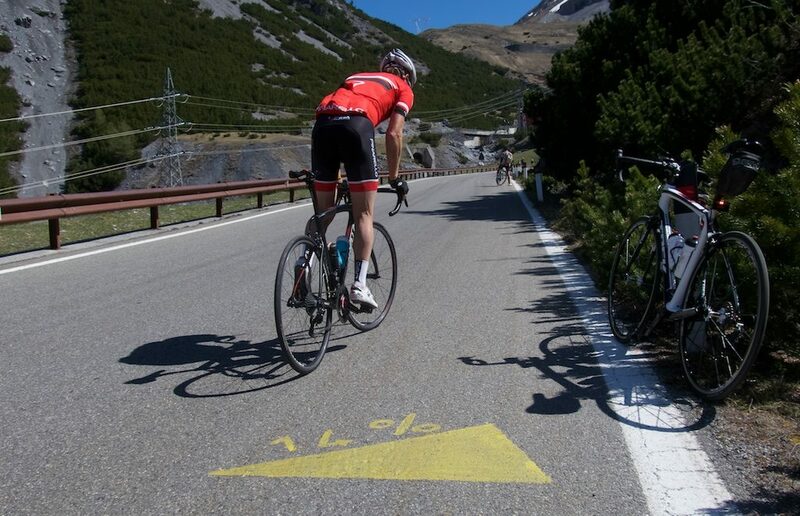 This descent is technical. Far more technical than the Bormio side. All the hairpins feel like sharp, inclined, 180 degree turns. I saw a couple of buses doing 4 point turns. Higher up, while descending, I tried to get a couple of shots “riding with lots of hairpins” using my mini tripod and timer. There was, of course, a lot of people about. Most people in great moods, drivers friendly, etc. As usual, the only people I dislike are the guys in old sports cars or Porsches who think they are rally drivers. Apart from the hairpins signs, there are few others. 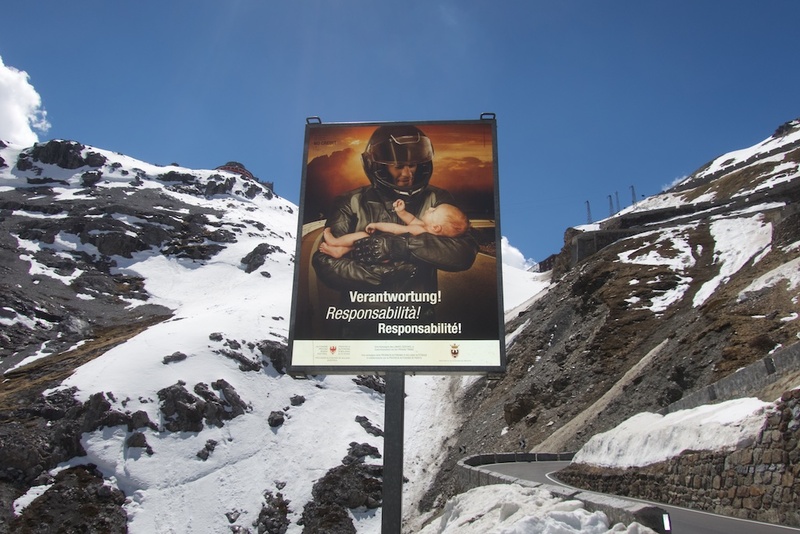 But there are several asking motorcyclists to act responsibly. 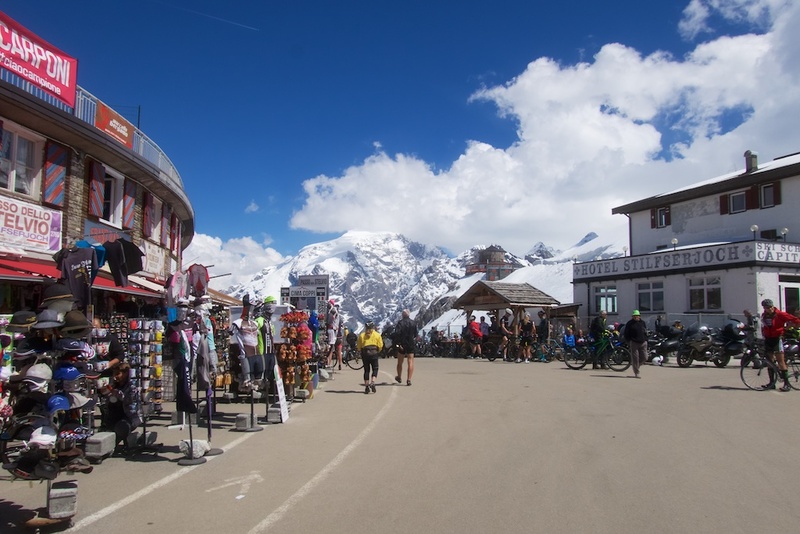 With perhaps 23 hairpins to go, I stopped for a coffee and snack. I noticed that I would be climbing against the wind. 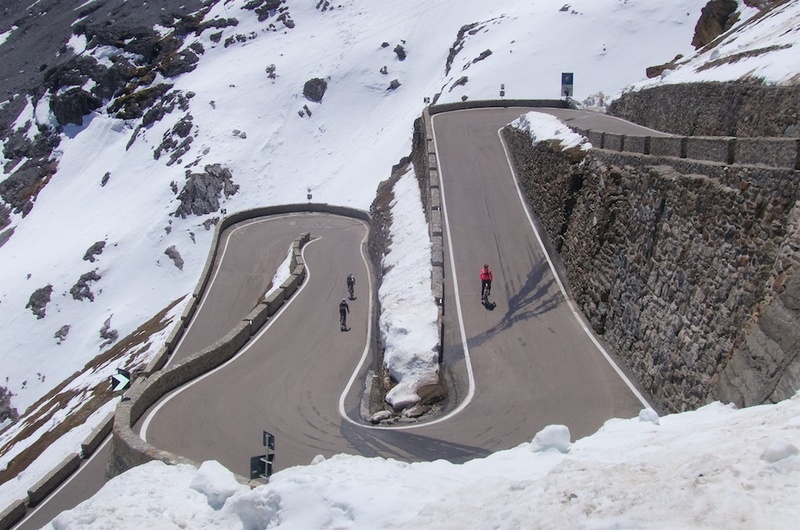 But — I would find out – with endless 180-degree hairpins, headwinds quickly become tailwinds. Summit high in distance. Windy. The views are as good as it gets. One really feels high, at the top of the mountains. Here is the last hairpin! And then it was back to where we started: Beer o’clock. PS – I have a silly hobby where I try and photograph Heart Shaped hairpins. Tougher than it sounds. My best candidate today, maybe 5 /10? 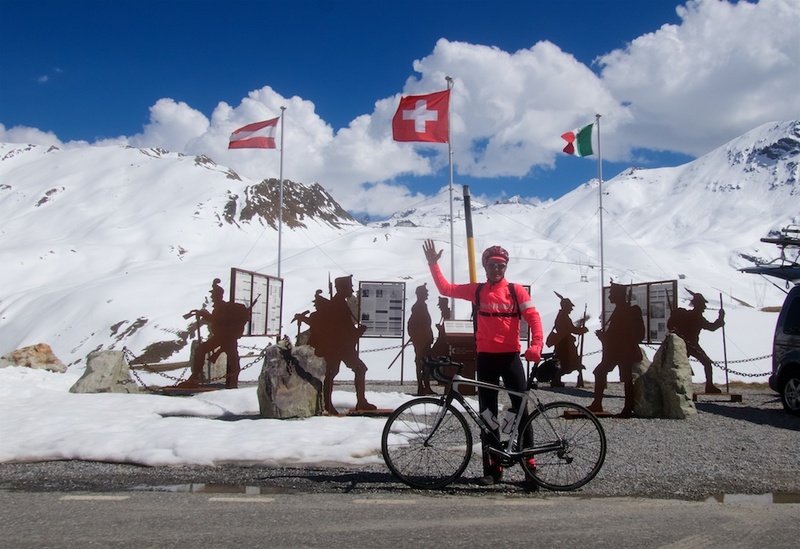 Awesome ride, fabulous photos, great post! Thanks for the great trip reports and photos. 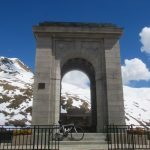 They were part of the inspiration for my girlfriend and I to travel to Europe, Italy specifically, to ride some of the famous climbs there. 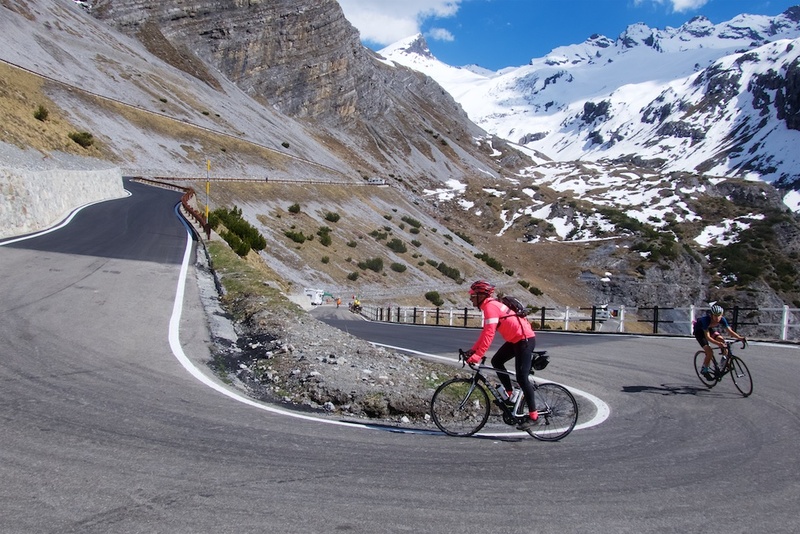 We spent time in Alta Badia before coming to Bormio for three days where we rode the Gavia and the Stelvio from Bormio then descending like you did down the more famous eastern side (not as far, stopped at switchback 28) far enough to enjoy this magnificent climb. 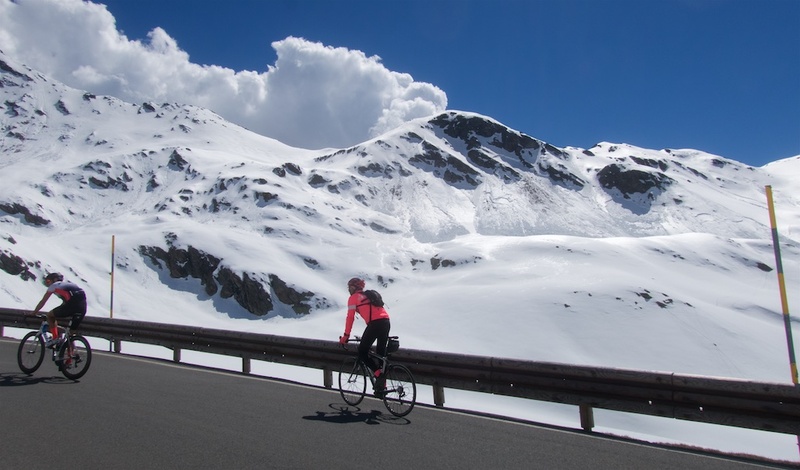 We had spotty weather while over there but the day we rode the Stelvio was fantastic. 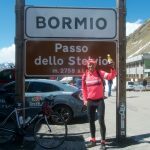 We were originally going to drive over to Prato and only ride the famous side but I think this ride you did is maybe the best way to do this ride, the Bormio ride is fantastic by itself and the last 10-15 km of the eastern side are the best part.